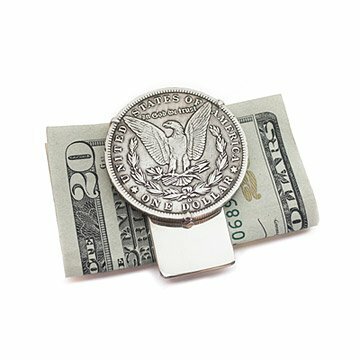 This money clip features classic Morgan silver dollars. Minted from 1878 to 1904, the shining silver dollars used to craft these elegant money clips are tangible pieces of American history. The vintage coin is named for its designer, US Mint Assistant Engraver George T. Morgan, and features an allegorical portrait of Liberty on one face and a majestic eagle on the other. The three-prong setting secures the coin on the sterling silver clip without damaging it and reveals the date when viewed from the back. Gift boxed with a certificate of authenticity. Made in Mexico. periodic cleaning with a silver cloth.